Over 1400 students living in Edgbaston’s Vale Village, the University of Birmingham’s, newest accommodation block, will be protected with Aperio wireless access control. When looking for an access control system to meet the unique needs of a student population, ASSA ABLOY was the preferred choice. 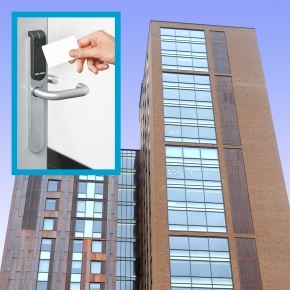 With a large number of people being housed, of which the population is constantly changing and with physical keys being frequently lost, University halls of residence have a complex set of access control requirements. Security managers are able to stay in control of the site with electronic access control with real-time monitoring. The Aperio is built using open standards, integration with Gallagher’s security system is seamless, and provides security staff with a single point of control over the site. The wireless devices therefore provide the university with a solution that integrates tightly with their existing campus-wide system, according to Jason Boyce, Sales Manager at Gallagher. Therefore, student rooms and entrance doors at both Chamberlain and Mason halls have been fitted with Aperio. Aperio is unique due to the fact that it provides audit trails online, allowing for the real-time monitoring of doors. The locks are powered by standard lithium ion batteries, making costs low for the university and removing the need for mechanical keys. For both Euro and Scandiavian profile doors, a mix of online escutcheons and cylinders have been installed. According to David Hodgkiss, National Sales Manager at ASSA ABLOY access control, many universities have chosen Aperio to protect their students while improving the overall student experience. ASSA ABLOY’s Aperio Technology enables a wide range of access control providers to cost-effectively integrate non-wired doors with mechanical locks into access control systems.